Might as well throw on the Zach de la Rocha wig for "Buy Me A Condo." I love this classic Al song! My favorite part in the video is when he burst into the diner and jumps behind the counter and his feet fly up. I don't know why but for some reason that just makes me crack up every time. Also I didn't realize that Al was eatting a banana in the hallway scene until a few months ago! And hey, that's a lot of years to not know that because I saw it when it originally premiered on MTV! Does anyone else think that the guitar solo in Al's version is better than the one in the original? It just sounds so much more extreme! Theguyoverthere @ February 24, 2009 03:05 pm wrote: Does anyone else think that the guitar solo in Al's version is better than the one in the original? It just sounds so much more extreme! No, sorry. Rick Derringer nailed it (and I get what you mean), but nothing touches Eddie Van Halen. Finally! Michael Jackson's and Al's signatures together on the "Eat It" contract! Yeah, I saw Al's tweet about that earlier today. That's pretty sweet! My favorite comment was that MJ "John Hancocked" that contract. HAHA! algonacchick wrote: My favorite comment was that MJ "John Hancocked" that contract. HAHA! What does that mean? Does it have something to do with the size of his signature? I expected Al's signature to be weirder . On the second thought, using one's name written in a tidy handwriting as a signature is unusual, maybe even confusing... At least in my environment, if someone have signed something like this, most of the people would react "no no, it asks for your signature here, not your name" or "you ruined the form, now I have to print it again!" . Yes. 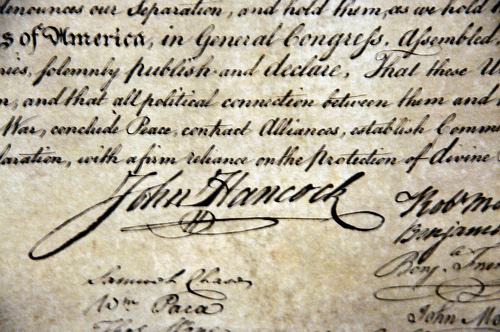 John Hancock signed the Declaration Of Independence, and his signature was quite large compared to everyone else's. As far as how neatly Al signed the contract, I guess when he was taught cursive in school, he strove for excellence.